Eco-friendly sterling silver Namaste Ring made from recycled silver. This sterling silver eco-friendly Namaste Ring is simple and elegant. The design is straight sided, with square edges that have been softened for a comfortable fit. The word 'Namaste' on this ring is only displayed in sanskrit, which is repeated and spaced evenly 4 times around the ring. "I honor the place in you in which the entire Universe dwells. I honor the place in you which is of love, of truth, of light, and of peace. When you are in that place in you, and I am in that place in me, we are one." Use this namaste ring to remember to focus in a place of love, truth, light, and peace. 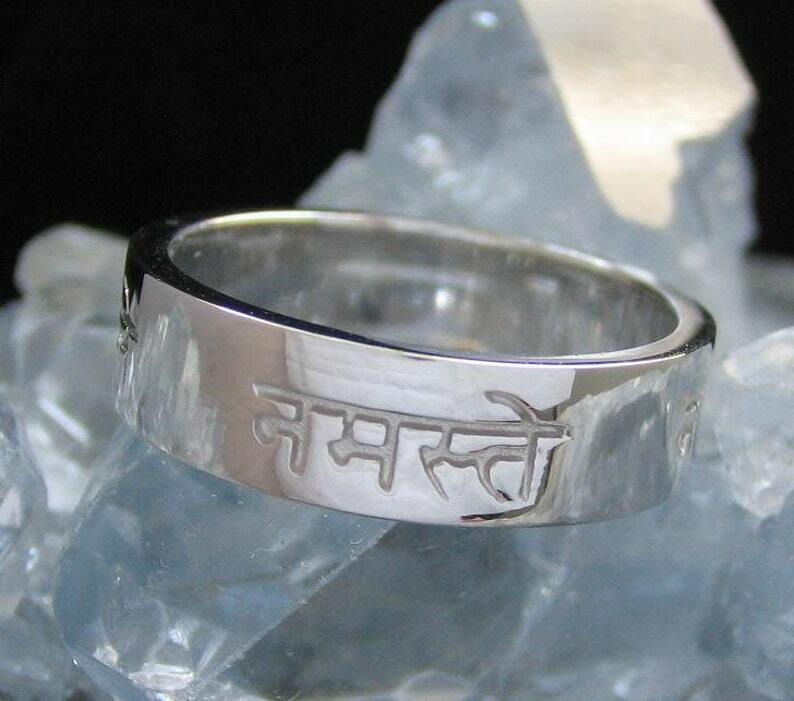 Wearing this version of the ring on your finger is a personal reminder and blessing, as the sanskrit will likely not be easily read by others. This Namaste Ring is made with eco-friendly, recycled sterling silver (a minimum of 92% recycled fine silver) and is approximately 1.75mm thick and 5.75mm wide (.0615 inches thick and .2275 inches wide). In the images on the right you will see two versions of the Namaste ring with sanskrit only - one with an 'antique' finish (the letters are dark) and one without. Please indicate your preference along with the size below. Each namaste ring is hand cast in New York City and hand finished. You can view the rest of our Namaste Jewelry Collection by clicking on the link to our store here on Etsy. Please note: If we do not have your size in stock when your order is placed it will take 12-15 business days for us to hand make the order for you. Beautiful ring and wonderful concept! I am impressed she got all the Ho’oponopono phrases on the ring and they are legible!! Very nice!! This is a beautiful piece that fits perfectly. We accept paypal and major credit cards (via phone order). Cancellation is within 24hrs of order placement. Taxes are collected for orders sold within New York State, United States. Any item can be returned for an equal exchange or a refund within 30 days. Item must be in original packaging and must be in original condition. Payson & Co., LLC reserves the right to inspect the item upon return/exchange. Please call 917-740-0361 for a return authorization number prior to shipping your return package. Returns without return authorization number will not be accepted. Returns/exchanges must be shipped with tracking AND insurance. Shipping is done via United State Post Office Priority Mail (insurance included) unless other carrier is requested (additional shipping charges may apply). International Shipments (outside of the United States) may have fees/duties. Any fees are the sole responsibility of the ordering party. Payson specializes in custom jewelry and would love to discuss custom projects with you. She also creates custom jewelry lines for other individuals and sells many of her products wholesale. Consignment is available under certain conditions, please inquire 917-740-0361. All jewelry items from Payson & Co., LLC (Payson Jewelry or Transformational Jewelry) are guaranteed. If you are not 100% satisfied, please take advantage of our 30 day money-back guarantee.